We are comfortable, family run apartments, close to all local facilities. Our accommodation is very clean, not very expensive and safety. The apartment is on the first floor of a house with just another one apartment in the ground floor. It provides around 45m² of living space and is suitable for a total of four people. The living room has big couch ( 160cm x 200cm), a TV and an integrated kitchen area - with dishwasher. It has air conditioning. The living room provides direct access to a nice, private terrace. The bedroom has a double bed ( 160cm x 200cm), a TV and its own air conditioning unit. The bathroom is very spacious and modern and provides a shower. Also washing machine is in bathroom. Hairdryer available in apartment too. Apart from the terrace there is also a balcony with see view, accessed from the bedroom. The Mediterranean garden is in front. A free parking space is available in front of the house. The apartment building is family-run. Wireless Internet access is available 0-24. Towels are changed twice a week and bed linen weekly. The price for air conditioning is per unit 5 euro daily. Cleaning fee is 3 euro per person per stay in cash on arrival. The 23m² apartment is on the ground floor and can accommodate two people. It has a bedroom with two single beds 90cm wide, which can also be joined together as a double bed. Right opposite the beds there is the TV. The kitchen has a dining space and is equipped with a stove, oven, fridge. The bathroom has a bath with a shower attachment, a WC . The air conditioning unit is in the bedroom. Wireless Internet access is available free of charge, as well as maps and information brochures. 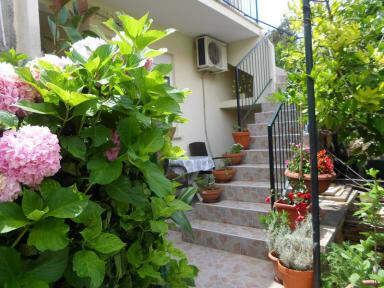 In front of the apartment there is a cosy little terrace furnished with seating . There is a parking space in front of the house. There is a bus stop right in front of the house, with bus line 6 every ten minutes in the direction of the old town, just a few minutes away. The Copacabana beach and other beautiful beaches are right nearby. There are also a range of restaurants, a supermarket, the promenade, a post office, a bank, a pharmacy and sports facilities, such as tennis and diving. 1.) The price for air conditioning ( one unit) is extra 5 euro daily ( also in winter heating is not include in price) - on arrival in cash if you will want use it . 2.) Final cleaning ( cleaning fee) is extra 3 euro per person per stay in cash. 3.) Smoking allowed outside not inside ! All taxes include in price!